I was so excited about my Euro4.90 Pate de Foie Gras sandwich from La Grande Epicerie that I forgot to include the other items we had for lunch! First let me say that when we travel (MM&Family) we try to mix up our food experiences, from eating at markets, shopping at delicatessens or food halls for take-out, and trying some fancy restaurants on occasion. It’s just more fun that way, and frankly, it is easier on the wallet as well. What we do generally try and avoid most of the time are the “tourist” restaurants, often known as the ones with “photos on their menus or posted outside the establishment”. I realize I am generalizing, but what I am saying is that don’t fall prey to those who are precisely targeting you, the tourist, with supposedly no other choice… In our experiences over many trips, we eat best when we eat at either end of the food spectrum… fantastic food at the market or street level in many places, and fantastic food at the nosebleed priced starred restaurants, if carefully researched. What almost always disappoints are the mid-priced restaurants, streetside cafes, etc. In Paris, it’s VERY EASY to take the easy route out and sit at a nice sidewalk cafe, order a mediocre to LOUSY onion soup and a main course and end up paying some Euro25-35 per person, when you could have had 7 foie gras sandwiches instead…heehee…I am exaggerating, of course. My other sister from New York (yes, I have two) happened to be in London on business and she decided to join us in Paris for a couple of days. She also had her daughter, my niece, fly out to meet us in Paris the day after she finished her classes at college. It was my niece’s first time in Paris and this was her first day out with us, before her mom arrived. 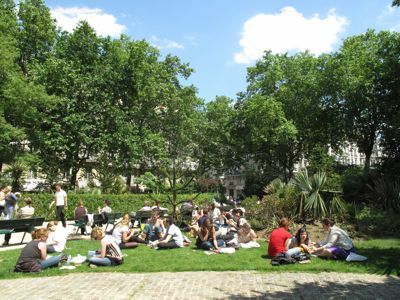 And we took her to La Grande Epicerie to buy a take-out lunch, which we walked over to a nearby park to eat on a bench! :) Mrs. MM and my niece each had an individual sized quiche, while The Teen opted for a brie sandwich (tons of brie in a baguette) and we all shared a salad of tiny mozzarella balls and cherry tomatoes with pesto. We had some special strawberries for dessert. Drinks for all and a perfectly good lunch for a reasonable amount of money. Love it! Yummy pate de foie gras, yummy quiche, yummy salad!!! More, more, more!!! MM, you have a house in Paris? Warm day in Paris, nice lunch with family, what more can you ask for? Priceless! viva, no not at all. This was our first visit back to Paris in 5-6 years… We stayed in a hotel. I couldn’t agree more about seeking great food at the low and high ends of the spectrum. Being a total cheapskate who lives in New York, I particularly revel in the cheap end of things, especially varied ethnic foods that are available in a city like this. If you know what to look for, that cheapie street food / food on the go /food from hole-in-the-wall places frequently yields more delicious + memorable food that mid-range restaurants offer. I remember Rachel Ray eat her lunch in the park when she visited France while taping $40 A Day show for Food Channel. Here in NY, we do the same thing with co-workers if weather and works permits. 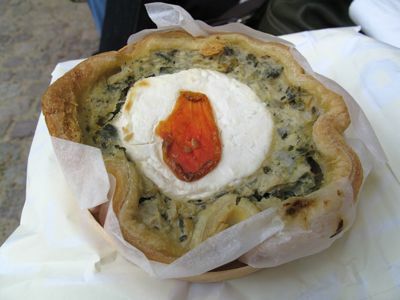 MM, is that an egg on top of the quiche? Or maybe cheese and a piece of tomato? When it’s warm outside the best show in Paris is a cruise on the Seine. Lots of exposed skin soaking up the sun. Haha. We do the same MM when we travel especially as a family. We have “fine dining days” then “deli days” then “fastfood days”..and ones where we put together our “finds” from several places like groceries,delis etc.. These delis provide food for a lot of the locals so they don’t have to cook or go to restos which can be expensive for them. And the choices are awesome….When we reach a destination especially if it is daytime,first order of the day is to “hunt” for he nearest neighborhood grocer,store,deli,supermarket etc and stock up on drinks,nuts,fruits etc. Ahh…so love travelling and the things you discover. You meet wonderful people too…. We too have discovered that the best restaurants (and most authentic dishes) are those that are not (or rarely) found in tourist books but accindentally found by going the off beaten path. Give me a jar of rillette, a baguette and a bottle of nice red, i am happy. MM, that is really true. You save money avoiding this tourist traps especially in bigs cities. My mantra is “go where the locals go”. And with a little netsurfing helps a lot too. 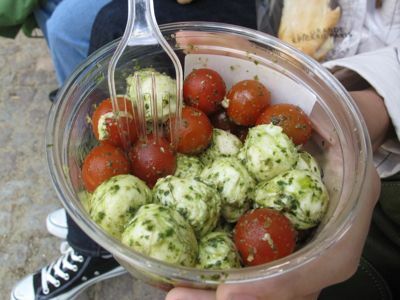 wow!…that mozzarella and cherry tomato salad looks yummy. ang daming mozzarella!! !